Turns out summer is over. So I figured it's time to post photos from the trip that kicked off the summer; Europe. I met up and hung out with Mom and Dad in Romania and Turkey, then I stopped by London on my way back to Hong Kong... so this may take a while. Alright, Romania. First off, we went to visit and stay with Kent and Angela, who were great at showing us around. Angela took us to a museum/park with traditional Romanian housing and handcrafts... 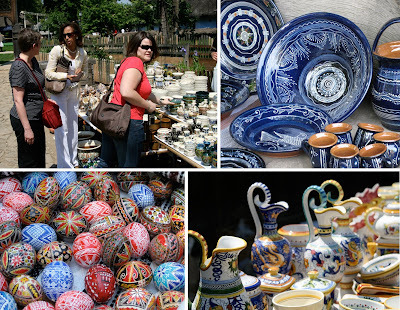 So here's a few shots of the traditional handmade Romanian goods. The ceramics and eggs had the most vibrancy and colour. 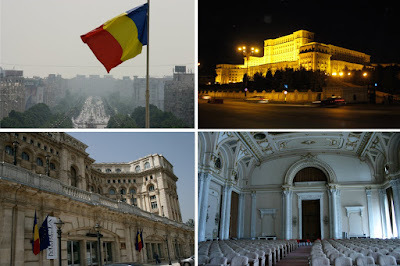 We're not going to dive into Romanian politics because I don't know much about them, but here's a few images of the Palace of the Parliament. Note: It's massive, I don't think the pictures do it justice. In a tour of the building we saw only a handful of the hundreds of rooms. 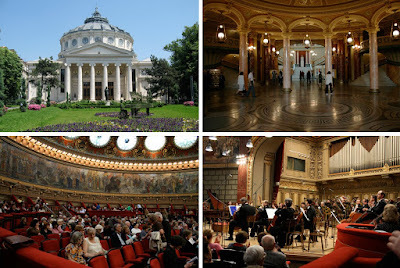 It has a great view of Bucharest and is an impressive site overall. Next up, we checked out the opera house which was gorgeous, inside and out. It was in great shape and still being used, so we opted to check out the orchestra, as you can see. 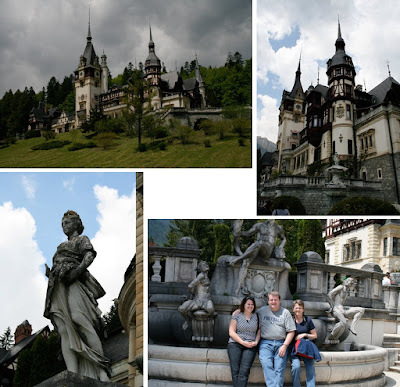 Peleş Castle, Dad's new summer home, which is a nice choice in my opinion. This castle was gorgeous, a nice get away up in the mountains, which provided a great drive. And what would a European castle be without a few sculptures... As well we have Mom, Dad and I in a photo - that was a rare occurrence, haha. Here's a few more of the sites in the countryside and mountains. First, Bran Castle (also known as Dracula's castle), near Transylvania. Next, a wagon of Roma wandering the countryside. We also checked out a monastery on an island that we had to hire a row boat to get to, haha. And a little scenic shot as we drove home from Bran Castle, it is a gorgeous country. I do have a few more things to toss up, but no more time today, so check back again, I'll add to this post when I get a chance. The ING Cup was going on last week, so we a got a little crew together and hit up the football matches last Saturday evening... 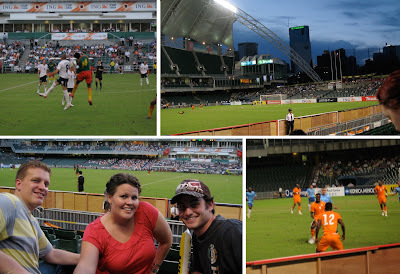 Sadly, the USA vs. Cameroon match wasn't the best, but Netherlands vs. Ivory Coast did help make up for that. All in all it was a beautiful night, with great games and great company, so you can't go wrong. Dad and Laur - the soccer photos are for you. The prior weekend a few of us hit up the beach and it was a delight. Hong Kong is hot, but there's no better way to beat the heat than swimming in the sea. I love it. 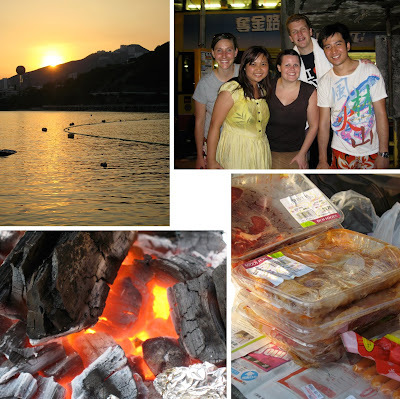 And since swimming always makes you hungry - why not have a bbq (chinese style) with everything slathered in honey...? Promise, it's a treat (almost as much of a treat as meeting an interesting man named Rick Mango, haha). So here's a little beach and bbq action along with part of the beach crew. Once again - about time I posted... Here's a few delightful shots - some of it is proof that Brad came to visit and that we are related, others just show the fun we had. So here it goes. Brad came out to Hong Kong at the beginning of May - just a few days before I took off for Europe, so we got to kick it and it was a delight. It'd probably been a year or so since I'd seen Brad last, so the Orient was a good place to meet up again. Alright, here's the proof that we're related - we both make strange faces in photos... not sure which face is worse, haha. 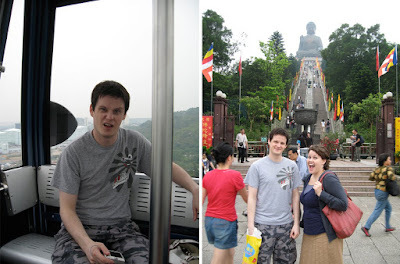 Anyhow, we took the cable cars up to the Big Buddha and saw a big metal Buddha. You may even note that Brad is not accustomed to Hong Kong's heat, whereas, I must have lived here long enough to be able to wear a sweater in heat and humidity... wow, that's a feat. 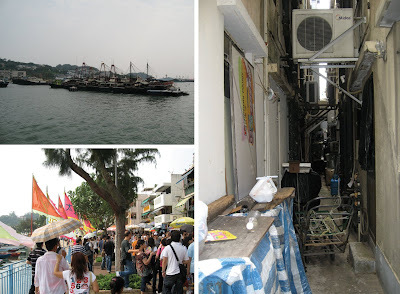 Next stop, was to the island of Cheung Chau - just a ferry ride away. A quaint little island with hardly any vehicles. Or normally a quaint little island... as you can see the masses were out and the ferry ride home consisted of a 2 hour queue to just get to the boat. Apparently, that's what happens when you go during the Festival of the Bun... haha. Though the queues were long all over the island, Brad and I got to see the most incredible parade we've ever seen... 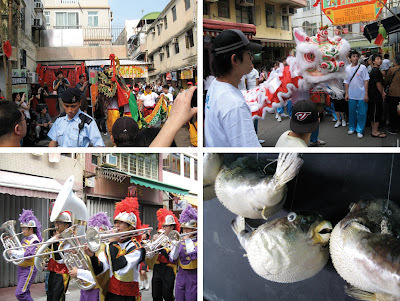 There was no beginning or end - just random snippets of parade everywhere we went. We' turn the corner and find a little slice of parade followed by nothing. And lastly, we almost got souvenirs for everyone - but they were just too realistic and breakable with those little googly eyes... Sorry, I know you all wanted a dried fish, maybe next time. Alright - here's the last of Vietnam - I'm working on getting photos of Romania, Turkey, and London up. But this is the first free night I've had in a while. 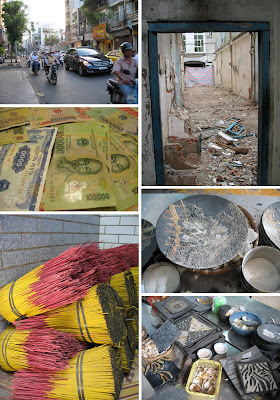 Anyhow - looking back at the photos I have from Vietnam reminded me of how many colours, smells, and sounds there were. It was fun to see - so here are a few samples of what I saw. Traffic is insane - motos everywhere, but crossing the street could be a death defying experience. Money - for the first time in my life I was a millionaire - too bad that only lasted a weekend. Bundles of incense. This was a door front that opened into a torn-down wreck and was right next door to buildings in good condition. A little bit of the arts - of course I had to add that in - I wanted to sit down and learn how to do the eggshell and lacquer art, but I don't think the tour bus would've waited for me. But here's a bit of the supplies and process of that Vietnamese specialty. And there you have it: a weekend in Vietnam (there are far more pictures, but these will have to do, haha). 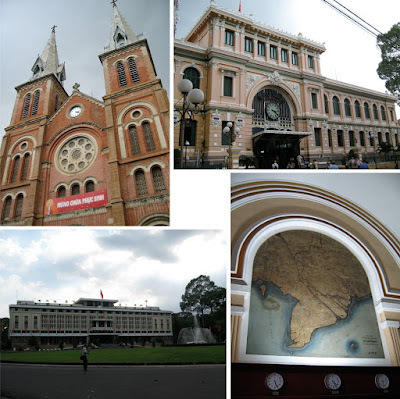 Turns out Ho Chi Minh City has some great buildings... who knew the Post Office would be a tourist attraction? And due to the French influence, they even have a Notre Dame cathedral. We also went to the Reunification Palace. Here are some of what we saw at the Reunification Palace. There were all sorts of nice conference rooms and what not, but this was the basement. I stopped to take a few photos and walking down that hallway alone definitely had some creepiness going on. 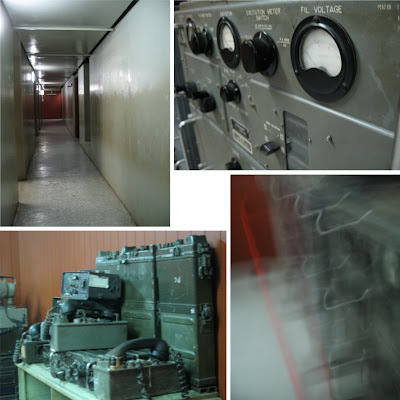 It was interesting to see some of the equipment they used back in the day, as well as the barrenness of the rooms. We had a tour of the Cu Chi Tunnels that are just outside of Ho Chi Minh. Our guide was demonstrating one of the entrances into the tunnels... pretty clever. What makes it even sneakier is how little you have to be to fit in there, I think you couldn't have a waist size above 34... The Vietnamese are small. 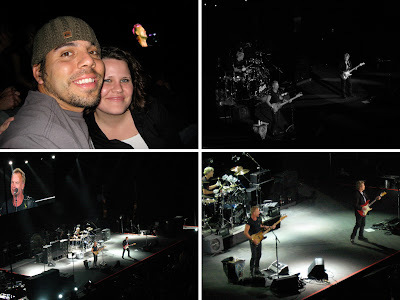 Here's a little of the ongoings of the past several months... As you can see, I like music and tend to head to the concerts of those I like, when given the chance. I've been a slacker on the blog scene, we'll blame that on ultra-busy-ness... I'm going to try to be better, I have a few different travels to toss up in the next little bit. Concerts are a delight... Bjork was great, she's pretty nutty, but fun nonetheless. The pictures are a little blurry, it's the best we could do. But we did have to pretend to be luggage on the train ride back to Hong Kong. 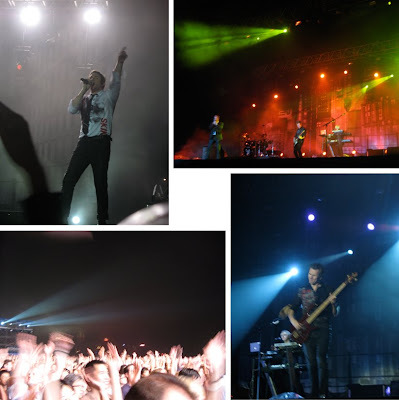 Duran Duran came to town(and a day after my birthday, they must've known) and it was a great show. And a great way to celebrate getting older. They rocked out and had a great set up... you can't go wrong with a huge crowd and the Hong Kong harbour and skyline in the background (pity you can't see it in the pictures that well). We had great seats... about 2 or 3 from the front, definitely a good time. 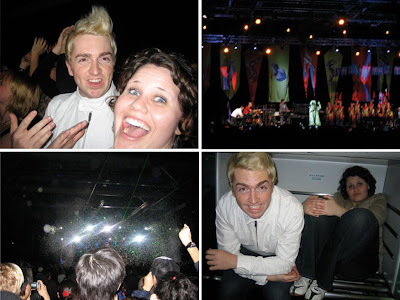 Here's a random little gathering of photos, don't worry, I'll explain. 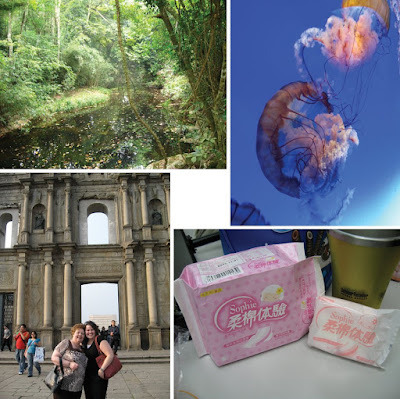 We've got a little scenic view from a hike, some jelly fish at Ocean Park (not sure why, but they fascinate me), hanging out in Macau with my Scottish mum, and some candy at work... I promise it's candy, despite what it appears to be... oh Asian treats are a delight. Promise I work, I really do. So far this little blog has been all my trips and playing, but I really do work too. Now, my work can be confused by some as playing, but it is a valid job. I have been working for a company that designs travel, security products. So here's a little update on what I do. I've been able to work on lots of projects, all sorts of things, from point of purchase displays to bags all sorts in between. The biggest project I have underway is a line of womens bags for 2009, which has been a good challenge, as well as a main reason for staying longer. 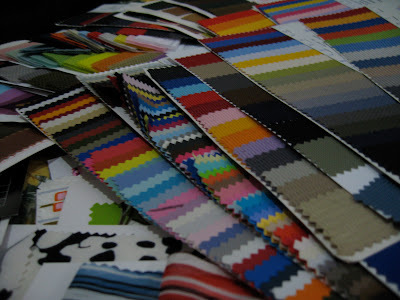 But here's one of the things I do for work and in particular this project: find fabrics. A colleague and I took a little trip to Sham Shui Po, the fabric district, and did some sourcing.. below is just a small bit of the result. And there you have it... a little peak into what I do for a living. It's great, definitely a good experience and job thus far. 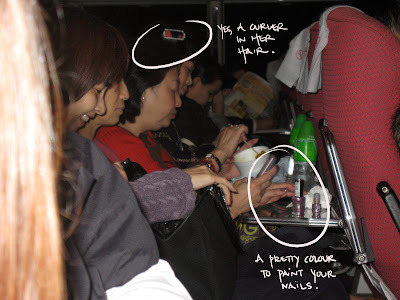 Promise it's the ferry and not a beauty salon. I almost asked if she could give me a manicure, but we just weren't sitting close enough. And I especially loved the one curler in the other lady's hair... just one. This is one reason why I love Asia, and just thought I'd share.